Here’s a funny short film which premiered at Sundance called The S From Hell. It’s a documentary about (fictional) people who recount their traumatic experiences after seeing the old Screen Gems logo that came after old TV shows. But first, here’s the actual logo. Now, here’s the documentary. The only frightening scene is where a boy collapses after watching the S From Hell and his head becomes a pumpkin, disintegrates, and a snake comes out. I don’t think the S From Hell was scary, myself. (But why is it “from hell”?) The new Screen Gems logo, which they show before all their movies, is kinda neat. It’s nice and quiet. Incidentally, it’s called the “S From Heaven”. Here’s the trailer for Fox Searchlight Pictures’ new dramedy Cyrus, about a man named John (John C. Reilly) who meets a woman named Molly (Marisa Tomei). The two fall in love, but one obstacle stands in John’s way: Molly’s son, Cyrus (Jonah Hill) who wants to protect his mother. The movie is “coming soon”. Comment! What did or didn’t you like about this trailer? Why? If you did like this trailer, are you excited for the movie? Tell me in the comments section below! No, no, no. It’s not like that at all. You see, Ribbon Hero is a videogame for your computer that’s supposed to make using Office 2007 and the upcoming Office 2010 more fun. How do you earn points? By learning how to do stuff in the Office programs using its new Ribbon interface. The official Ribbon Hero website shows a video with a man telling you “how to stay ahead of your competition”. Hey Microsoft? It’s a learning game. Not really a competitive game. Free at www.officelabs.com/ribbonhero. And of course I’m going to try it. Guess What I Saw At Dictionary.com Today? An advertisement for Cheer. The laundry detergent. Right on the home page. Um, hey Cheer? Never do that again. I mean, a dictionary website? Of all places! Also, I don’t have to watch an ad when I open my printed dictionary, do I? Just sayin’. Hey, remember Sharlto Copley, the guy who ingested that weird serum and his DNA turned into that of an alien’s in the District 9 trailer? He’s back in another film, along with other names you might recognize: Liam Neeson, Bradley Cooper, Mr. T…they’re part of the new movie called The A-Team, which, I learned from Wikipedia, was a popular ‘80s TV show. I have not watched said show, but from the trailer it looks interesting. And the movie looks good too. It’s about these soldiers who are framed for a crime they didn’t commit and are now soldiers for hire. They look for a way to clear their name. I’m sure I would have to watch the series to get some of the references in the movie, but other than that it looks okay. Also, does anyone know who Liam Neeson is in this trailer? Is he the guy who says “I love it when a plan comes together”? Because if so, wow. If so, I did not know that that was him, and I’m not sure what to think. Alan Rickman’s American accent was cool in Die Hard, but this one…I don’t know. You might have heard of the zero-day attack on Internet Explorer which came from the Chinese attacks on Google and other corporations a few days ago. The exploit code has since been released online (read here for more info). IE 6, 7, and 8 are at risk, even those that are installed on Windows 7. Microsoft said it was working on a patch, but for now you are advised to use a different browser. Here are your options. Like McAfee SiteAdvisor, EULAyzer is an essential tool for any computer. I’ll show you how it works. 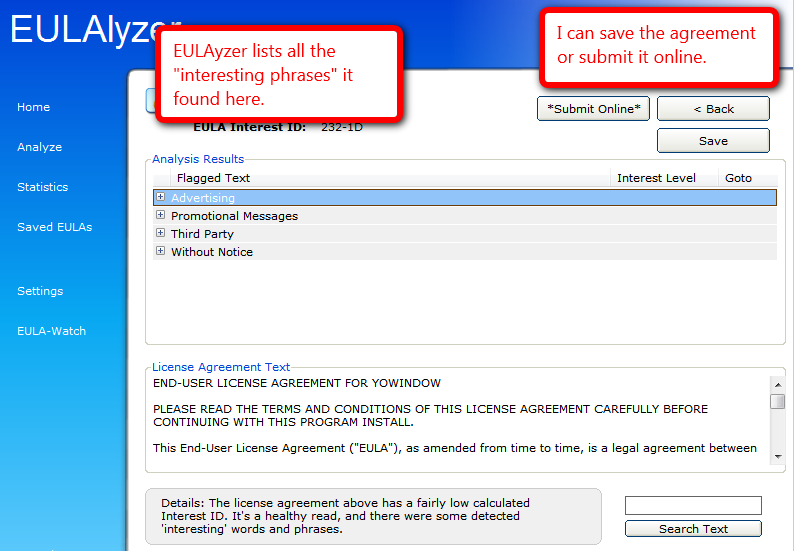 It lets you take the license agreement of a program you’re about to install and plug it in to EULAyzer, which then analyzes it and tells you about any “interesting” words or phrases, such as if the program is going to install adware and badware on your computer. It’s actually really cool. Here’s EULAyzer. I’m going to use a screensaver called YoWindow as an example. Next, I can just drag the plus sign to the license agreement. Sorry, I haven’t got a video for that. Blogger doesn’t paste it in. Anyway, after I’ve done that, EULAyzer comes up with its list of interesting phrases. Neato!